Elite: Dangerous will be receiving its 1.1 update in February, and headlining the list of additions is something called ‘Community Goals’. These new objectives are designed with multiplayer in mind, and will hopefully begin to rectify Elite’s problems with playing as groups. With its online structure, various different Community Goals can be added to the game whenever developer Frontier likes. As such it appears that goals will turn up in waves, with the first batch being focussed on supply and bounties. 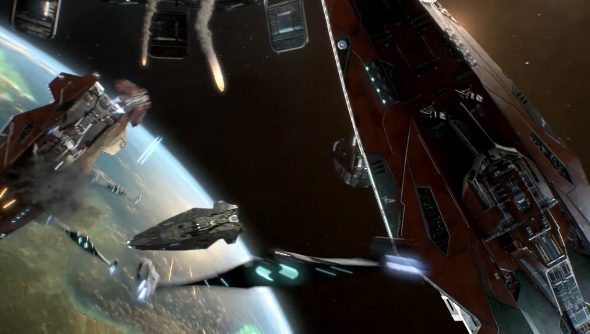 “A faction might task our pilots with racking up a number of kills in a particular system, effectively sending massive numbers of players to war for or against particular group,” explained Brooks about bounty goals. Elite: Dangerous can be a lonely experience, and the current lack of cooperative options doesn’t help even when you can meet up in virtual space with other friendly pilots. Hopefully Community Goals is just the start of more multiplayer-friendly features for Elite. The 1.1 patch will also add a new shader to make gas giants look much prettier, and city lights that will be visible on the dark side of populated planets. People who bought Elite: Dangerous at beta will be able to access the patch early, but general release is early February.